Seeing all your amazing costumes this Halloween was a real treat, but the trick was picking just one for the grand prize. 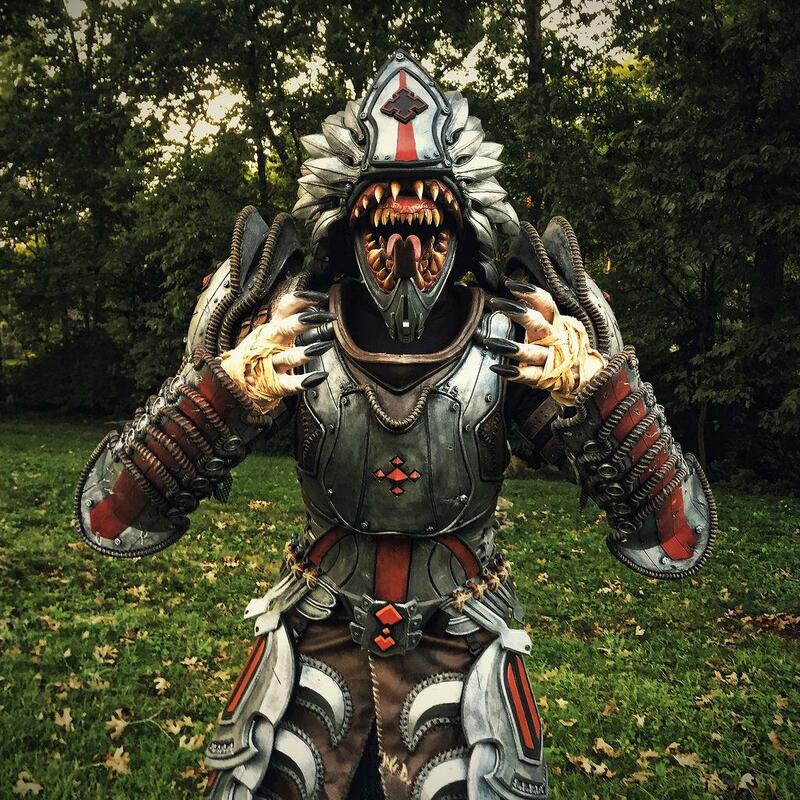 Eric Jarman and his costume "Armored Kantus"
To create this beautiful and terrifying beast Eric used foam fabrication, cast hardware, digital sculpting, laser cutting, and 3D printing. His costume is a great example of combining multiple disciplines and techniques to bring a character to life. Thanks again to all of you who submitted so many outstanding costumes! Please join us in congratulating Eric on winning the Grand Prize! HI, folks! This is actually my very first post in the school, and I would like to start by showing off the BioShock Big Daddy costume I made here in Brasilia, Brasil, in the span of 14 days, from beginning to end. The drill rotates and the lights on the dome are changeable from yellow to red and vice versa. In it, I am about 2.25 meters tall, it´s about seven foot six, roughly. Hi guys! I am thrilled to see all the fantastic work here, so inspiring! I am a costume construction student in Wellington, New Zealand and this is my graduation project. She is a Lord of Change, modelled after an illustration from Warhammer - The Age of Reckoning. The mask is fully articulated as you can see in the two short videos. I loved working on this project, it was fantastic to be able to immerse myself so completely into the recreation of tiny details and trying to figure out which materials to use, especially since we had to stick to a very tight budget. We were allowed to spend NZ$ 200 on store bought materials and were given an allowance of NZ$80 on stock we had in the workroom (mostly fasteners, interfacing...) so all in all NZ$280 for this baby and I am happy that I could pull it of! Big challenge with a big reward! Looking forward to see more great work here!! I took on a large Halloween project and this was my first time using L200 foam, creating latex masks/molds, electronics with voice changers/speakers, making a vacu-form mold and custom painting. I grew up loving Halloween and each year I expand my knowledge building unique costumes. I went to the extreme this year to see what I could accomplish. Hope you enjoy. Hello! First time posting here. 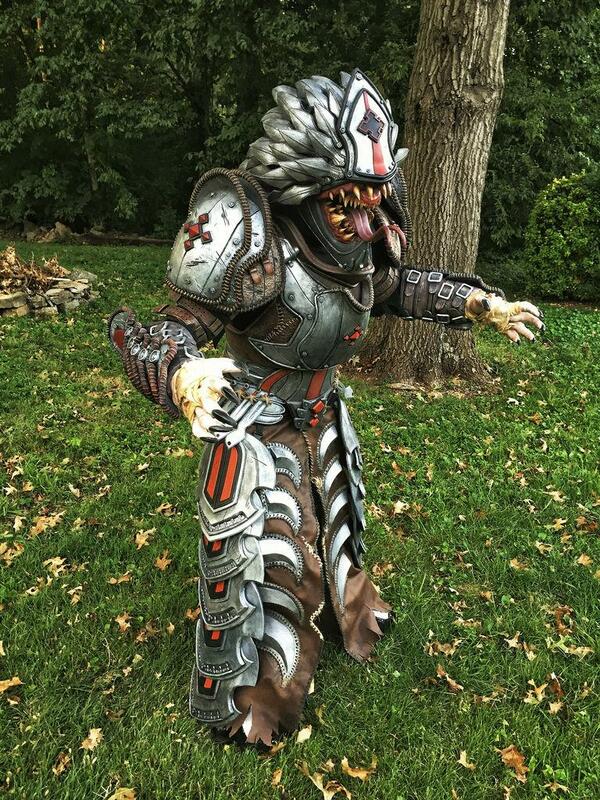 This is my costume that I made using Ted Haines tutorials. 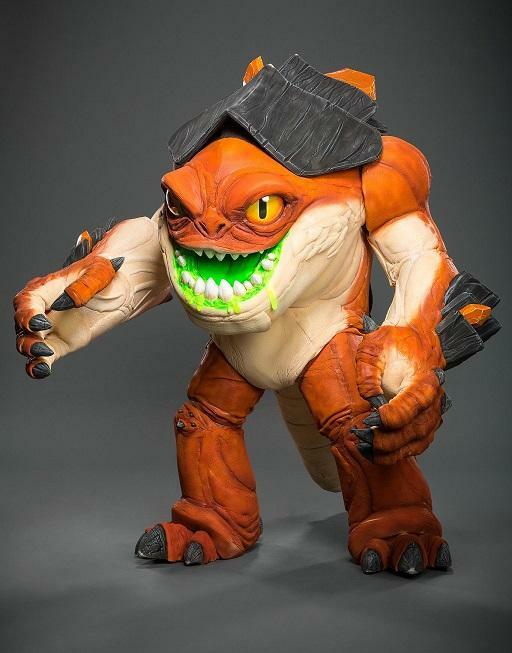 I loved watching him make the giant foam T-Rrex and learning the technique he used. I got the monster building bug and just had to build this creature! This is a Goren from World of Warcraft concept. Hello Trick or Treaters! I'm a sculptor and prop maker from Montreal and I love nothing more than making cool Halloween costumes! When this year my 5 year old daughter told me she wanted to be a robot (a long lasting obsession of hers) I was not going to disappoint her! A brief search on the internet quickly informed me that most parent's idea of a robot costume is a square box wrapped in tin foil, so I decided to create something that was as far away as possible from that. This is an original alien sculpted then cast in silicone and painted. The costume elements are also original with a latex covering and painted. Visually this was inspired by various dinosaur, lizard, turtle and fish reference animals. This is my Gears Of War Locust. 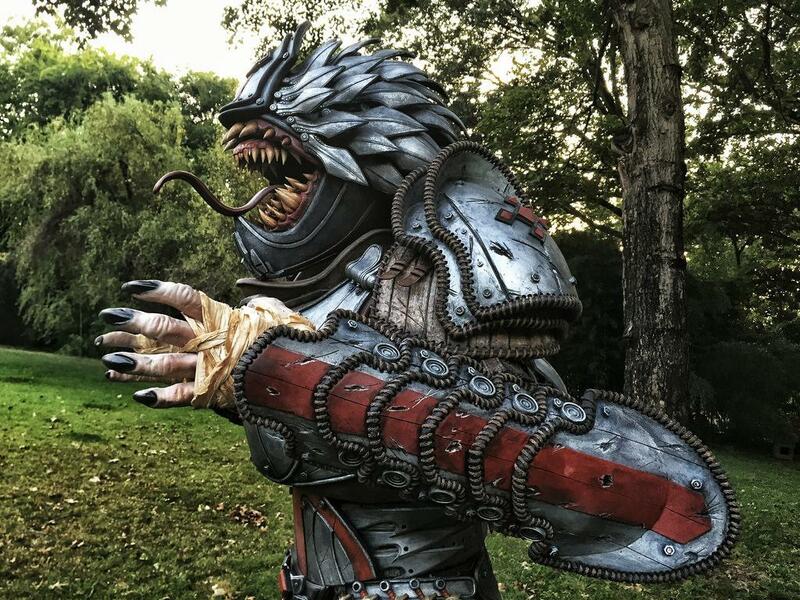 Everything was made by me except the gloves which were made by Niko from Faceoff. In the suit I'm about 6'5", normally I'm 5'8. The armor is all EVA foam as well. The face was sculpted and cast in latex with a Flex Foam-iT! 3 backing. Happy Halloween! These are pictures from the costume of my Chaos Chosen. Everything is designed and build by myself (except the chainmail). The armor is made out of kevlar reinforced plastic. The weapon is foam with latex and LED lights inside. Hope you like it! We must use the Chaos inside of us to create things out of the order! Excellent! I would run a mile from this...! Now just have to wait and see who made the top ten. Amazing costume Eric, so much detail! But guys, who are the runner-ups? wow, im one of the top ten awesome. All the costumes were amazing. Cant wait to start my 3 months of streaming. I will be playing the hell out of those videos for sure. Very honored to be a part of the top 10! all the other winners were amazing! I got a professional photo after the contest period, you can enjoy the full res image here! What an honor to be amongst the top 10, such amazing compagny! Does anyone have any idea how we can access the 3 month illimited viewing? check your feed. Mine is showing up now but did not get notification it was activated. If you are in the top 10 you should get an email soon with information about the 3 month access. You decide well! This are awesome costumes! Very good job! !